climbs from the traditional village Calejão, that education and culture of Cape Verde owe a lot to, to the pass at Tope de Vermelin '. With increasing height the views go further and further over the planalot, Preguiça airport and far to the east, on the Monte Bissau in the nowadays desert-like peninsula to Carriçal. Due to the wide, in earlier centuries enormously fertile boiler Portela draw wide mule roads; the views leads up to Monte Gordo and the coast at Tarrafal. The further course, alternatively by Fontainhas and for distance hikers also to Tarrafal (101a) or after Cabeçalinho (101) is less strenuous. the a local marked as Casa Araújo in Calejão [CALE04] (285m) whera a paved steetleading down to the Posto de Fomento Pecuário encounters with the main road. Walking the main road 220m ↘downhill, after the first turn, [TOPVER01] an unpaved road pulls horizontally ↓ into the fields. In some places is still to realize that it was once a broad mule road. 200m further on [TOPVER06], one must not chose the path leeding uphill to the fields, but to cross by the Ra and continue for another 500m ↘ on the slightly rising track. The former mule-road paases a crumbling homestead [TOPVER12]. Some 100 m later the track turns ↙ uphills, and becomes steeper and climbs, partly over the decayed mule road, partly as lousy path through the rubble. Finally it reaches over a series of serpentines, leaving the summit of Tope Vermelin' to the south, the pass [PORT04] (634m). For the first time you see Portela, the wide pan, once the pride of the wealthy landowners. Three broad mule roads served the area. At the pass [PORT04] (634m), a branched, while the heights of the southern peninsula have gotten no rain, poorly recognizable shepherd-way to the south, which is always on the crest about Tope de Mesa (755), Tope de Guincho and Morro Alto reaches the Cha de Fidalgo on the tip of the peninsula. Very far, in the final descent very poor and yet a wonderful trail in Richigen view. We have not received it because of the dangers involved, but who want to get to know him, the offers a one-hour trip to Tope de Mesa already the feeling. after the break at the pass it goes to the western edge of Portela, 600m ç through the open terrain, because the old ways are overgrown. The open space, come together at the three large mule roads, is the goal. [PORTELA] (591m). 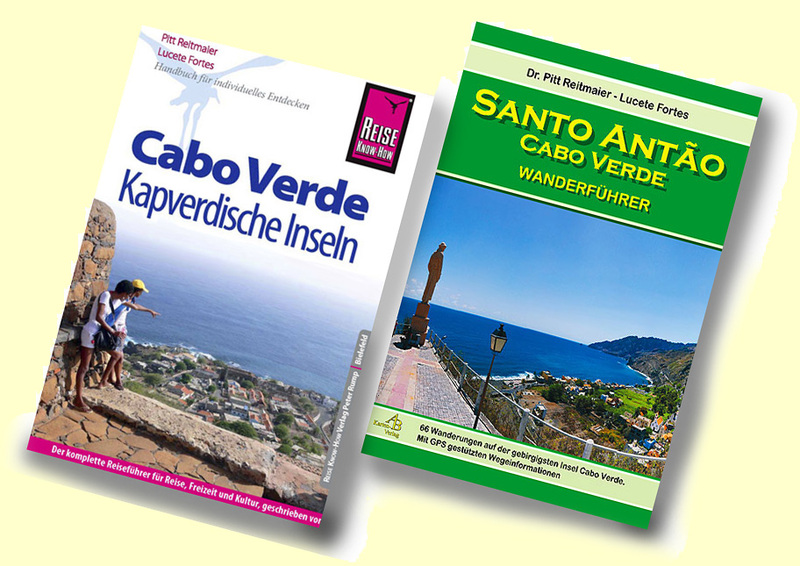 rises from the traditional village of Calejão, to which education and culture of Cabo Verde owe a lot, steeply up to the pass at the Tope de Vermelin'. With increasing altitude the view continues over the plateau, the airport Preguica and further to the east, over Monte Bissau into the today desert-like peninsula to Carrical. 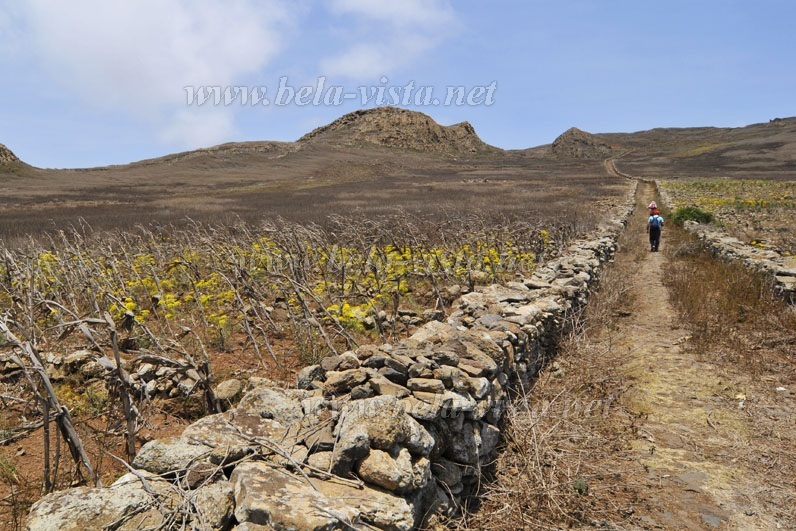 Wide mule roads pass through the wide basin of Portela, which was enormously fertile in earlier centuries; the view leads up to Monte Gordo and to the coast at Tarrafal. The rest of the route, alternatively to Fontainhas and for hikers also to Tarrafal (101a) or to Cabeçalinho (101), is less strenuous. is the shop marked Casa Araújo in Calejão [CALE04] (285m) at the meeting of the main road with a paved street leading down to the Posto de Fomento Pecuário. Following the main road 220m slightly downhill ↘ after the first bend, an unpaved path branches off to the slope [TOPVER01], which horizontally pulls ↓ into the fields. In some places it can still be seen that it was once a wide, traced mule track. 200m further on [TOPVER06], it is not a matter of choosing the path that is sometimes more heavily traveled downhill into the fields, but of crossing the Rª and remaining another 500m on the only slightly uphill path at ↘ . Thus one reaches, directly at the way convenient, a disintegrated homestead [TOPVER12]. The path bends 100 m then downhill to ↙ , becomes steep and climbs partly as a decaying mule track, partly as a bad path through the scree in serpentines, passing north of Tope Vermelin, the pass [PORT04] (634m). For the first time one sees Portela, the wide pan, once the pride of the wealthy landowners, crossed by three wide mule roads. At the pass [PORT04] (634m), as long as the heights of the southern peninsula have not received any rain, a badly recognizable shepherd's path branches off to the south, which always reaches the Cha de Fidalgo on the top of the peninsula on the ridge via Tope de Mesa (755), Tope de Guincho and Morro Alto. Very far, in the last descent very bad and still a dreamlike hiking path with a clear view. We did not take it because of the dangers involved, but for those who want to get to know it, a one-hour detour to the Tope de Mesa already offers the feeling. after the break at the pass we go to the western edge of Portela, 600m ← through the open terrain, because the old paths are overgrown. The open place, where three big mule roads meet, is the destination. [PORTELA] (591m). leads in a good half hour to Fontainhas, a more propper closed village with cattle breeding, a well running all year round and connection to a dust road suitable as a hiking trail to Tarrafal, which is also used from time to time. from Portela the path goes straight uphill to Selada Portela [PORT12] (698m), almost the highest point on the way ↑ to Cachacinho, the detached farmhouse to which the path ← climbs after crossing the Rª [PORT14]. At Cachacinho you can take the shortcut ← or take the main road past the farm and follow the well-passed road ↖ to the road in Cabeçalinho [CABE20] (585m). is a junction from the road in Cabeçalinho [CABE20] (585m). It is located about 350 south of the junction at the water distribution point, where a modern concrete building suspended in height cannot be overlooked. The clear path to Cachacinho branches off at the beginning of a quarry stone retaining wall ↘ .